Merry Christmas to Derby everywhere ! Happy Holidays! Feel free to visit Blood and Thunder All-Stars for a taste of the first period from the match. This is a small thank you and taste of the action to come from the first period so far. [Search YouTube for “joemac2323” to see the first period]. Hope you all find all the skates and tools and Hot Across Buns you have all been dreaming for under your Christmas and Holiday trees ! You have all made this an amazing year! The ladies on the track representing leagues from across the country – from the west of B.C. Terminal City Rollergirls TCRG to Montreal Roller Derby MTLRD through Ontario’s FCRG Thames Fatales and Forest City contingent, GTAR’s Newfie Bullet, NCRD Sister Slag’s Low Ride Her, onto Newfoundland’s ambassador for 709 Derby Girls’s Rainbow Fight plus Boo Ya Ya from San Francisco for the inaugural Blood and Thunder All-Stars bout at the Hangar all eager to show their new found skills in two teams divided into Black Mambas and White Trash. Low Ride Her scored her four points calling off the jam as bodies crashed to the floor-not for the last time that night. With two minutes to go in the first period the score 79-21 Black’s Low Ride Her scored a double grand slam. And it looked like the rout was on. But never count anything out. Halftime spectators demanded that Quadzilla make his famous leap and volunteers from the crowd tried to pile onto the track as willing victims. White Trash got off to a blazing start on the second half with Rainbow Fight jamming against Black Mamba’s Soul Rekker that soon evidenced a passing the star to Lulu Demon and together they poured on 17 points to cut the lead to 86 to 43. The second half turned into a nailbiter as White were egged on by Quadzilla standing by the bench in tandem with the coach in red of Black. Two jams later Lulu Demon in white matched up against Sister Slag’s Low Rider Her who hit the floor while Lulu Demon battled a succession of hard blocker hits for a grand slam. Score 94-51. With Low Ride Her caught as a goat in the White pack Lulu Demon racked up 20 points on her jam and an excited Crankypants only revving up the crowd even more as White pulled ahead 121-13. Then Bambi struck back for Black with a 14 points. And time out was called with 6:05 left on the clock. Assassinista AK-47 and the rest of the next line huddled with Coach Pauly issuing instructions. The jam ended with 10 points for Hustle Rose for White and Black Mamba’s Georgia W. Tush in the box. The Black lead was reduced to the slimmest 132-131. Another time out called and White cheering each other on their bench. The second period ended with no time on the clock and after a tough tussle between Tush and Lulu Demon and Demon sent to the box the scoreboard showed Black Mambas with a 137-136 victory over White Trash. But with a time out having been called the clock was rolled back to 3 seconds and both teams with 10 points accrued by both jammers accelerating the score to 142-141 still in Black Mambas favour. Shades of the Regionals! However, after a long timeout Bambi was back on the jammer line all by her lonesome with Lulu Demon in the box and after facing a tough back wall of Mirambo and CommieKaze she scored two more points and called off the jam. Even with this final jam going in Black Mamba’s favour there was still prolonged discussions amongst the zebra crew and NSO. Finally the score was confirmed and Black Mambo could cheer their hard fought win. It was indeed the fastest and one of the most exciting exhibitions of Derby at The Hangar since CN Power took on Hammer City at QCC – and great to see players not seen on the track since Quad City Chaos and new players alike. [Note: there is video and DVD courtesy of our camera and Pepper Assault behind the iris]. Thank you to all the teams and players and organizers and everyone there and not there for all their kindnesses that made everything possible. 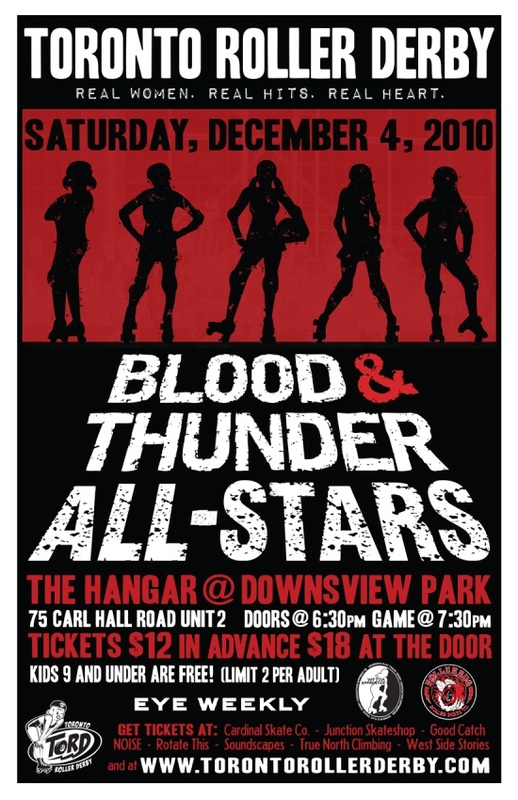 The Blood and Thunder Roller Derby Training Camp in Toronto details are here. With attending coaches AZRD’s Coach Pauly, jumping skater and genius Quadzilla, TXRD Smarty Pants, Gotham City’s Suzy Hotrod there will be lots of derby excitement and four days of learning at The Hangar December 2 to 5. For those not in Toronto but have Derby fever in Timmins this weekend here is their information. Information will be provided and all members of the board of directors will be on hand to answer any questions. Please bring $3 for admission to the skate. 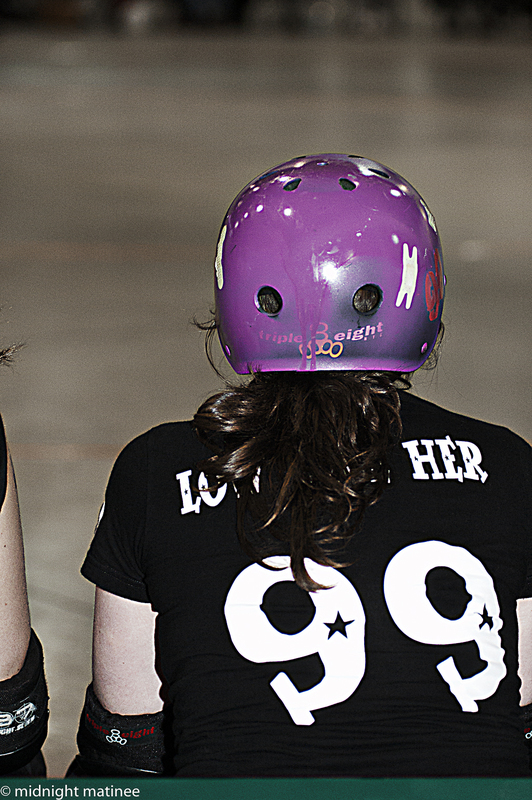 Up in Capital City Derby Dolls land their site is active so follow along. So everybody have a fun Derby weekend and lots of Christmas Derby shopping!